The belt composition means that 50% of the shells (HEFI-T) are useless against tanks while the other 50% (API-T) is nearly useless against planes. However, this belt is reliable against open-topped or thin-skinned vehicles like SPAA vehicles. Since there are no dedicated high-explosive shells for the selection, having one belt of this in reserve does not hurt for those situations. This belt offers a good transition from the Default to the PzGr 40 APCR belt. The round offers decent use and damage against lightly armored tanks, especially at close range. Due to lack of high-explosive filler however, it is better to focus on the PzGr 40 belt to maximize penetration power. Probably the best belt with the best penetrating shell for the vehicle. While the damage effects post-penetration can be quite poor, the rapid fire from the autocannon can mitigate this problem by following up quickly with another penetrating shot. In close combat, these shells should be used against modules and crew member to make the most of each shell. 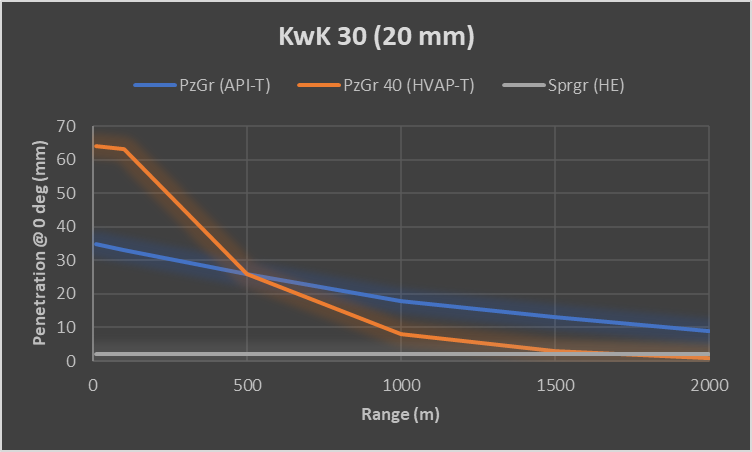 Against angled armor, however, the APCR ammo may not be very effective, just like any other APCR shell.